Two layers of moist yellow sponge cake filled and frosted with creamy vanilla buttercream. Colorful balloons, confetti and Happy Birthday message complete this festive cake. 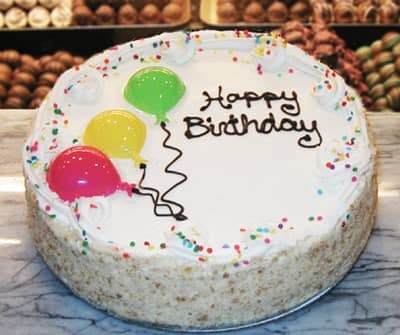 Our 8 inch Vanilla Birthday Cake is two layers of yellow sponge cake filled with rich vanilla buttercream. The whole cake is then hand frosted with the creamy vanilla buttercream. "Happy Birthday" is written in dark chocolate, a few balloons are added and candy confetti is sprinkled along the top to give this luscious cake a very festive look. MAKE IT AN INSTANT PARTY!!! Inside your "Party Pack" your friend will receive 12 plates, 12 forks, napkins and a box of candles.